This morning, I made this delicious creamy smoothy. I needed to use up a few things in my fridge so I made this fab filling yummy smoothy! Take your beloved Vitamix & place all ingredients in this order in it. Place fitted lid & tamper on. Blend on high-speed until it is fully mixed, using tamper to push ingredients into the running blades. This took me 10 seconds. Taste. You must taste the passionfruit & coconut. 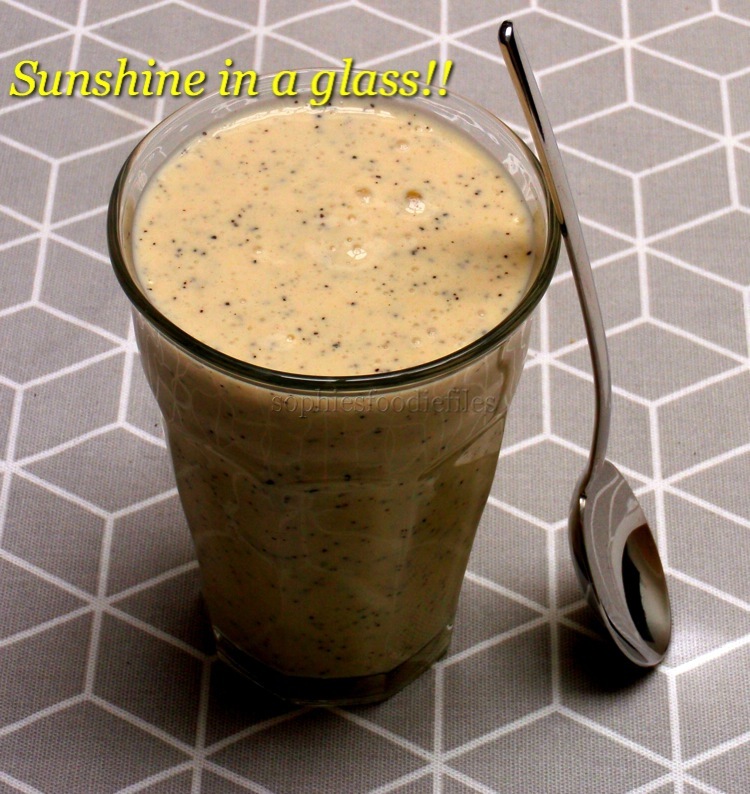 Pour into 1 big or 2 lovely smoothy glasses & enjoy with a big smile on your face! 🙂 MMM!♥ Stay Tuned & subscribe by email! Join 1,800 email subscribers now!!! It is free!!!! Click the link here below to subscribe!!! Previous Post Vegan, Gluten-Free creamy green asparagus pasta! Next Post Vegan Strawberry Spelt Crumble! That looks really creamy and delicious! So easy and refreshing..With summer here around the corner, I really need this! Mmmmm! Looks amazing. I’ve never purchased passion fruit. How do you choose one and know when it’s ripe? mmm. . . The smoothie looks delicious. It really is, Sheryl! I already made it a few times! Me too! Enjoy, dear Charlie! A gorgeous name for a gorgeous smoothie! Oh Sophie, I know you’ve been dealing with health issues for too long. Hope you are feeling well as can be soon… God bless. I recently discovered a new pot-set coconut yoghurt in the supermarket. It’s so delicious. I must go and buy some more for my lunches next week. I made your lovely tasty smoothy this morning & loved every sip! yayy! Now everybody is happy! It is a plant-based yoghurt alternative, you can buy it sweetened or not & you can make it yourself too!